Special Notes: To ensure passage, boaters must arrive at least 30 minutes prior to closing. Notes: There is no gas in the immediate vicinity (closest is at Merrickville). 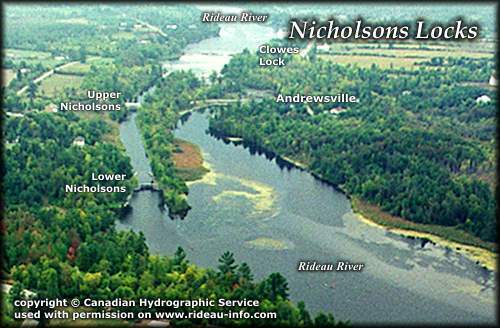 Upper and Lower Nicholsons are separated by 400 m (1,300 ft.) of canal cut. * Time to actually go through the locks. Allow at least twice this time when trip planning. See Schedule Caveats. 1) GPS data should not be used for navigation. See the GPS page. 2) Washrooms are wheel chair accessible. 3) Unless indicated otherwise, water at the lockstation is potable. 4) Includes both blueline and greyline docking - see Lockstation Docking Page. 5) Allows tent camping for those arriving by water and also for cyclists and hikers. Note 1: 180' of blueline docking available during lock operating hours between U & L Nicholsons. Nicholsons Locks looking SouthwestThe two locks at Nicholsons are located in a canal cut on the east bank of the Rideau River. It's a pretty trip through the cut, especially the white wood swing bridge over the lock at Upper Nicholsons.